Model MAGLVL1 hall effect level sensor is designed for versatility and ease of installation. It is designed to interface directly with many different controller types. The sensor is a bipolar hall effect sensor with dual outputs and built in pull-ups, allowing a single sensor to independently sense and signal north and south pole magnets. The sensors control the input to darlington quad sink drivers, which can directly drive most PLC 12 - 24 VDC sink inputs, as well as on-board relays that can be used to drive virtually any type of input up to 60 watts. The built-in power supply provides 5 VDC sensor power as well as 12 VDC relay power from 14-24 VAC power, or from standard 120 volt AC power when the on-board transformer is installed. On board LED indicators show when an output is turned on. The standard unit can provide up to 8 separate signals. The MAGLVL1 sensor is very compact with a foot print of approximately 2 x 3. 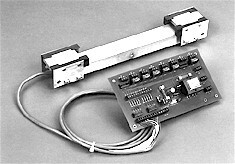 The interface board is approximately 5 x 8. The 2 steel tape can accommodate up to 3 lanes. Tape and sensor mounting is designed to accommodate a wide range of configurations with minimal hardware. Tap mounting kits are available.